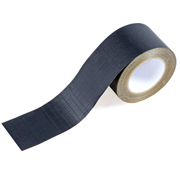 PAROC BlackCoat Tape is an reinforced aluminum foil tape with a black color lacquer finish acrylic pressure sensitive adhesive and siliconized release paper liner. It is an ideal for sealing the joints when using PAROC BlackCoat products such as sections, lamella mats or slabs. PAROC Tape BlackCoat gives a great finish and safe installation. Rolls / carton: 75mm / 12 pcs, 110mm / 8 pcs. During the installation, the insulation material to be taped should be at a minimum temperature of +10 Celsius. Allow the temperature of the insulating material to adjust to the ambient installation temperature. Make sure that the surfaces to be joined with tape are clean, dry free of dust and grease. Surface must be free from oil, fat, dust and solvents before film/tape application. Do not use cleaners containing anti-adhesive agents. Some plastics and paints may discharge antiadhesive agents leading to bonding failure. Rough and uneven surfaces may weaken bonding.